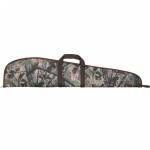 52" Floating Shotgun Waterfowl Case Scope height 7.5" Velcro fold over end ..
Three Magazine Pockets Designed to Hold 2 Mags Each Front and Rear Accessory Pockets Internal Gun Securing Strap and Barrel Pocket Detachable Padded Shoulder Strap Padded Handle Grip Easy-clean Polyester Lining .. Fits rifles up to 48 inches. .. Fits shotguns up to 52 inches. .. 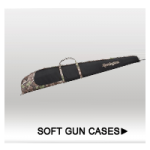 Rugged Endura shell Dense foam padding Non-absorbent lining to protect your firearm External pocket for gloves, ammo and other accessories Heavy duty web handles Internal dimensions 46" x 9.5" External Dimensions: 48.5" x 10.5" x 2.75" Realtree Xtra ..
Black and Gray oversized gunsock is great for rifles with large scopes, even extra high scopes. 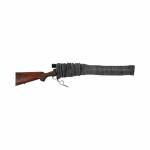 Silicone treatment prevents rusting Silicone treated knit fabric Will not hold moisture Fits most guns with or without scopes Drawstring closure Black and Gray Size 4.5" x 52" Holds guns up to 50" ..
Endura shell 1/2" foam #5 zipper 42in. Pink Camo ..
* Silicone treated knit fabric * Will not hold moisture * Fits most tactical guns with or without scopes * Drawstring closure * 42" ..
Allen’s patent pending Wedge Tactical Case has thick foam padding, soft knit lining, and rugged Endura fabric to protect your gear inside and out. 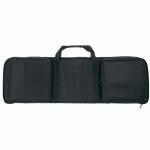 The case also features multiple external pockets for magazines and other accessories as well as a padded hook and loop carry handle. 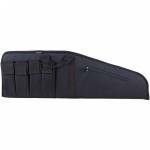 Lockable 32" ..
Bulldog Colt Standard Tactical Case - Black 40in. 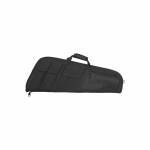 Colt logo black rectangle gun case. Unique reverse slant design allows MR to be carried scope up. Extreme duty water-resistant outer shell "No Melt" laminated heat-resistant inner lining won't stick to warm barrels Super thick padding provides maximum protection for your MSR "High Vis" lined extra-large accessory pocket provides extra visibility in low-light conditions 4 universal magazine pouches (.556/.223, 7.62x39, .308) with reinforced Velcro flaps Heavy-duty oversized zipp.. The Bulldog Economy Range Bag with Strap is another range bag option for extended shooting sessions with a more economical price in mind. It still features Bulldog's durable water resistant nylon, large main compartment, and extra exterior storage pockets. 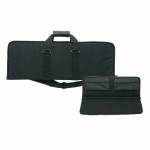 The Economy Range Bag also has carry handles and an adjustable/removable should strap for carrying convenience. 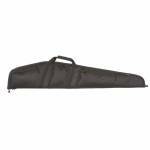 Durable Nylon, Water-Resistant Outer Shell Large Main Compartment Outer Pockets For Extra Storage Adjustable Shoulder S..
35" Nylon Black Discreet AR15 case. 2 1/2" total soft padding Full-length heavy-duty zipper with pull Durable, extra heavy-duty Nylon, water-resistant outer shell Brushed tricot soft scratch-resistant Inner lining Extra Large main compartments with 6 hidden magazine holders Wrap-around carry handles Fiber reinforced sidewalls for extra durability Fits guns up to 33" Height: 11" ..
40" Nylon Black Discreet AR15 case. 2 1/2" total soft padding Full-length heavy-duty zipper with pull Durable, extra heavy-duty Nylon, water-resistant outer shell Brushed tricot soft scratch-resistant Inner lining Extra Large main compartments with 6 hidden magazine holders Wrap-around carry handles Fiber reinforced sidewalls for extra durability Fits guns up to 38" Height: 11" ..
Bulldog's Extreme Tactical Rifle Case is constructed of durable, heavy-duty nylon, water-resistant outer shell, heavy-duty double stitching, and a #10 heavy-duty, full-length zipper with pull. It has a zippered accessory pocket, and a laminated Tricot, heat-resistant inner lining, and a total of 2.25" soft padding. 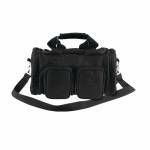 The Extreme Tactical case has four Velcro-close external magazine pouches, and a removable, adjustable shoulder strap with swivels. This case is black with black trim and is 38" in le..
Bulldog Hybrid Tactical Case Discreet Design Rigid Sidewalls w/ “Hybrid Technology” Deluxe Padded Shoulder Strap Hidden Internal Pockets For Extra Magazines Black w/ Black Trim Hybrid 31" Rifle Case ..
1 1/2" total soft padding Full-length zipper with pull Durable Nylon water-resistant outer shell Brushed Tricot, soft scratch-resistant inner lining 5/8" Closed Cell Padding #8 Full Length Zipper Length 40" ..
1 1/2" total soft padding Full-length zipper with pull Durable Nylon water-resistant outer shell Brushed Tricot, soft scratch-resistant inner lining 5/8" Closed Cell Padding #8 Full Length Zipper Length 44" ..
1 1/2" total soft padding Full-length zipper with pull Durable Nylon water-resistant outer shell Brushed Tricot, soft scratch-resistant inner lining 5/8" Closed Cell Padding #8 Full Length Zipper Length 52" ..